Since 2010 Greece’s social and economic conditions have been irreversibly transformed, a result of austerity measures imposed by the European troika and successive Greek governments. These stringent restructuring programmes were intended to make it possible for Greece to avoid default and improve its debt position, and to reconfigure its economy to escape forever the burden of past structural deficiencies. Eight years later, none of these targets have been met. If the programmes were doomed to fail from the start, as many claim, what were the real objectives of such devastating austerity? Pavlos Roufos answers this key question by setting the story in its historical context. Analysing the creation of the Eurozone, its ‘glorious’ years, and today’s threat to its existence, he locates the development and management of the Greek crisis in terms of both the particularities of Greek society and economy and the overall architecture of the monetary union. 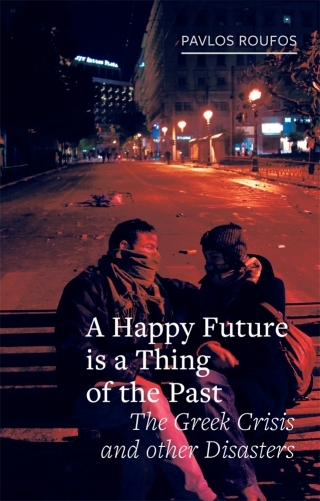 He also illuminates the social movements that emerged in Greece in response to the crisis, focusing on what both the crisis managers and many of their critics presented as a given: that a happy future is a thing of the past. Pavlos Roufos has been active in Greece’s social movements since the 1990s and has written on Greece and the economic crisis for the Brooklyn Rail (New York) and Jungle World (Berlin). He has worked as a film editor and is currently a researcher on German economic policy at the University of Kassel.